During the month of December, city residential sales reached 1,172 units. This brought the grand total for 2013 to 23,489. Furthermore, prices for 2013 increased by 8.6 percent when compared to the previous year. In keeping with the trends that are typical for December, both new listings and transactions were down when compared to previous months. On the other hand, sales activity in December did remain in line with long-term averages. Furthermore, despite the poor weather conditions, there were more new listings in December 2013 than there were in December 2012. This is at least partially due to the fact that some sellers saw that prices were still increasing and thought now was the right time to put their property on the market. In fact, market conditions continued to favour the seller through much of 2013, with price gains seen in both the single-family and condo sectors. For the month of December, the single-family benchmark price increased by 0.3 percent to $472,000 when compared to the previous month. When compared to last year, these gains reached 8.6 percent. Overall, unadjusted single-family prices grew by more than 7 percent for the year. These figures were larger than the previous high figures achieved. While the overall data shows that prices have recovered in the single-family market, it is important to note that the same is not true for each community and for every type of home. Higher-end homes that are priced at above $500,000, for example, are experiencing a slower pace in price growth when compared to the lower-price segment. Furthermore, there are still many communities that have not experienced growth beyond previous highs. The number of single-family homes sold in 2013 also increased when compared to the previous year, with a total of 16,302 being sold in the year. This represents an 8 percent increase when compared to 2012. 2013 also saw a total of 22,569 new listings, which is nearly 1 percent higher than 2012. Meanwhile, condominium apartments also increased by more than 14 percent to 4,007 units and condominium townhouses increased by 22 percent to 3,180 units. The increase in condo sales is largely due to the fact that they provide a more affordable option than single-family homes. This makes them an attractive option for first-time home buyers who wish to pay toward owning a property rather than rent. Investors are also purchasing condos because their prices still have not recovered to their previous high marks. In December, for example, condominium apartment prices averaged $278,600 while condominium townhouses averaged $207,100. This represents a 6 percent annual benchmark price growth for townhouses and nearly 9 percent for condos. Both prices and sales activity are expected to improve in 2014, though they are not expected to improve at the same rate as they did in 2013. Increased competition from the new home sector in 2014 is expected to help alleviate some of the supply pressure experienced in 2013. 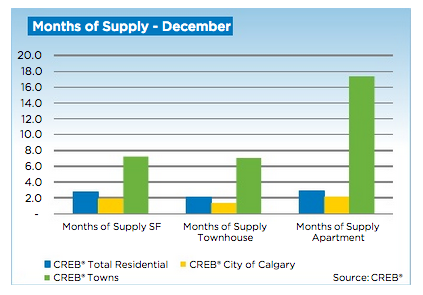 2014 will be a great year for housing in Calgary. They expanded the MLS system to include rental properties. This is a great help for renters and landlords.